Getting a drivers license marks a rite of passage for adolescents, and having one is seen as a sign of continuing independence for American seniors. In 2009, 87 percent of the driving-age population (age 16 and over) have a license. There are 685 drivers for every 1,000 residents. In 1960, just a few years after all states required driver licensing, there were only 487 drivers for every 1,000 residents. In 1970, 112 million drivers were licensed. There were 1.3 male drivers for every female driver. In 2009 there are 210 million licensed drivers, a compounded annual increase of 1.6 percent. 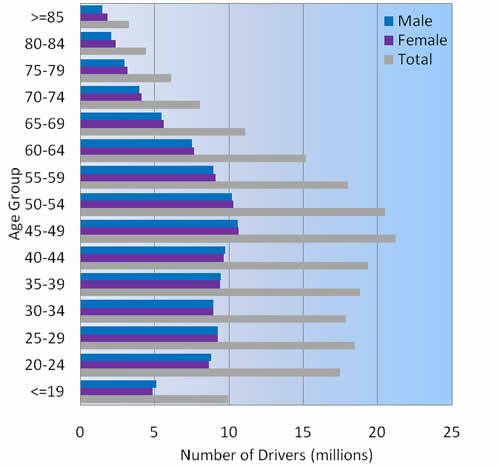 In 2005 the number of licensed female drivers exceeded the number of licensed male drivers. 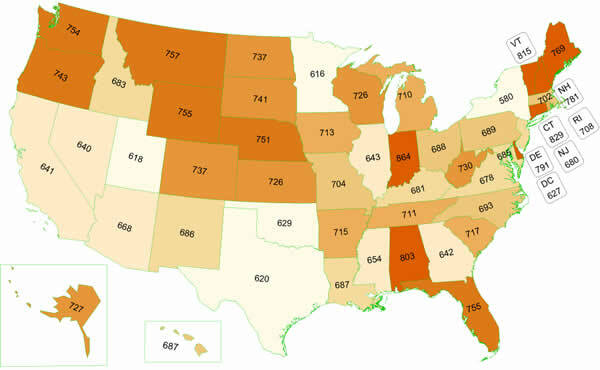 The number of licensed drivers per 1,000 residents differs significantly from state to state, ranging from 580 licensed drivers per 1,000 state residents in New York to 864 licensed drivers per 1,000 residents in Indiana. In addition to Vermont other New England states – Connecticut, New Hampshire, and Maine – have higher rates of licensed drivers per capita, as do Alabama and Delaware. States in more rural northern mid-west and mountain areas, such as Montana, Nebraska, Wyoming, have higher rates of licensed drivers per capita. Oregon and Washington also have a greater number of licensed drivers relative to their populations. As the population follows the aging "baby boom" generation, the trend in licensed drivers follows. In 2009, the 45-to-49, and 50-to-54 age groups are the largest cohorts of drivers. Following the population in general, 80 percent of licensed drivers are between the ages of 20 and 64. Five percent of licensed drivers are under the age of 20, while 16 percent of licensed drivers are age 65 or older. 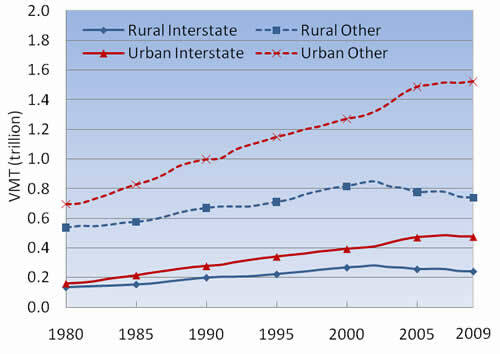 Data Source: FHWA OHPI, Highway Statistics. Note: Drivers under the age of 20 are not shown because of varying state licensing requirements and census age data availability. Comparing drivers by age with the population of the United States in 1990, 2000, and in 2009, a trend emerges that a greater proportion of older drivers are retaining their licenses. In 2009, 84 percent of those 70 and older have drivers' licenses. This compares with 74 percent of those 70 and older who had licenses in 2000, and with 66 percent of those ages 70 and older who had licenses in 1990. This trend appears to begin with the 45-to-49 age cohort. For younger age groups the opposite effect seems apparent, with a slightly lower percentage of the population licensed in each group in 2009 compared with 1990 and 2000. 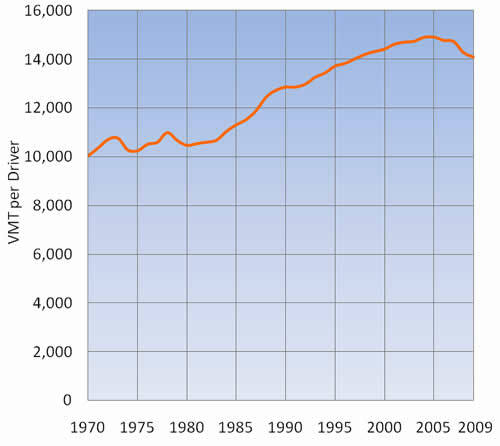 VMT per licensed driver has declined since 2005 after steadily increasing for three decades. VMT in 2009 is 1.2 percent lower than in 2008 (a reduction of 200 annual VMT), and is 5 percent lower than at their peak in 2005 (a reduction of 800 annual VMT). 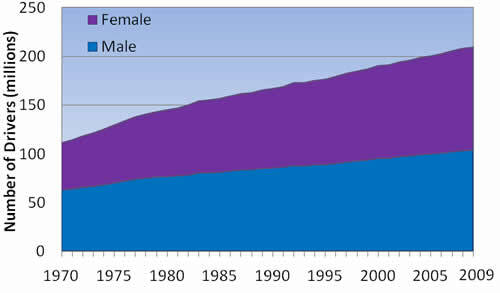 From 1980 until 2005 VMT increased at a compounded annual rate of 1.4 percent. Including all years from 1970 to 2009 VMT increased at a compounded annual rate of 0.9 percent. Sixty-three percent of daily vehicle trips are between one and nine miles in length, according to the 2009 NHTS. The responses indicate that 16 percent of all daily vehicle trips are between 10 and 19 miles in length, while 9 percent are between 20 and 49 miles. Trips less than one mile in length are 10 percent of all trips, while long-distance travel (trips of 50 miles or greater) are three percent of all trips. A majority of all VMT are from trips 20 miles in length or greater. Trips between 20 and 49 miles in length are 26 percent of VMT; trips 50 miles in length or greater account for 31 percent of VMT. Trips less than 20 miles in length account for 43 percent of VMT. These findings indicate that most personal vehicle trips are short, with seven of every 10 trips less than 10 miles in length. However, trips less than 10 miles in length account for only 23 percent of all VMT, indicating that frequent, shorter trips are prevalent, but those trips greater than 10 miles in length account for a majority of road use. Conversely, long-distance travel (trips of 50 miles or greater) account for three percent of all vehicle trips by number, but represent 31 percent of all household-based VMT. NHTS responses reveal that 392 billion person-trips are made annually in 2008. Of those trips for which a purpose is determined 61 billion (16 percent of trips with a purpose) are for commuting. Trips for school and religious purposes account for 10 percent of weekday and weekend travel, a total of 38 billion trips annually. Trips for social and recreational purposes (including vacation trips and trips to visit friends and family) account for 23 percent of weekday trips and 39 percent of weekend trips, a total of 108 billion trips annually. Trips for personal and family-related purposes (such as shopping trips and trips for medical care) are 43 percent of weekday trips and 42 percent of weekend trips, a total of 167 billion trips annually. Ninety-one percent of all commuting trips occur on weekdays, with the majority of these trips starting between 5:00 and 10:00 in the morning and again between 3:00 and 7:00 in the afternoon. 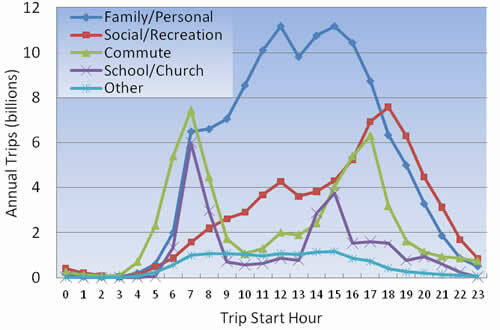 Trips for school and religious purposes have a weekday pattern similar to that of commuting trips, but with a smaller afternoon peak between 2:00 pm and 5:00 pm. Sixty-four percent of all family and personal trips occur on weekdays between 7:00 am and 7:00 pm. 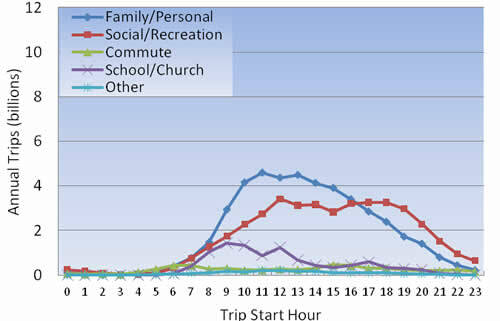 Sixty-two percent of trips for social or recreational purposes occur on weekdays, most in the early evening. Peak commute periods also include high levels of non-work travel for purposes such as family and personal, school and church, and social activities. Including trips by all modes of transportation, the number of non-work trips occurring in midday actually exceeds the number of commuting trips in peak travel periods. As most of the trips throughout the midday are local, short trips, they potentially have a greater impact on energy use and air quality than on highway congestion. 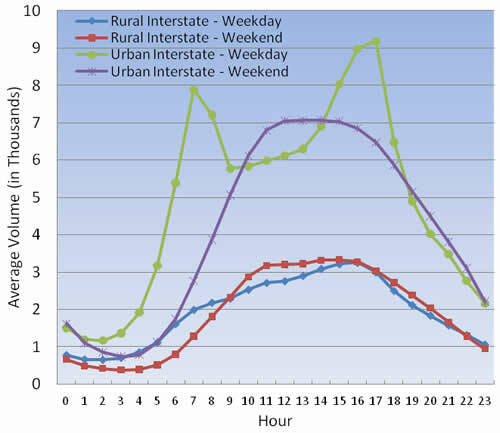 Hourly travel volumes are shown for selected urban and rural Interstate highways during weekday and weekend periods over a year, illustrating typical travel patterns. 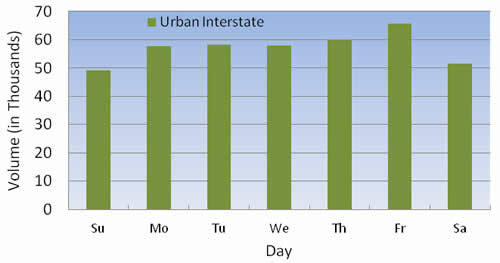 Weekday traffic on the urban Interstate includes AM and PM commuting peaks. Significant but gradual weekend traffic peaks later in the day and decreases through the evening. 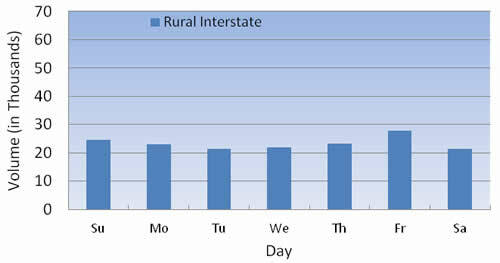 Hourly travel patterns for a rural Interstate highway, also during weekday and weekend periods, does not show commuting peaks. The distribution of traffic on this facility shows weekend volume that exceeds weekday traffic. The volume of travel occurring each day of the week is shown for selected urban and rural Interstate highways over a year, illustrating typical travel patterns. Friday is the busiest travel day for both rural and urban Interstates. 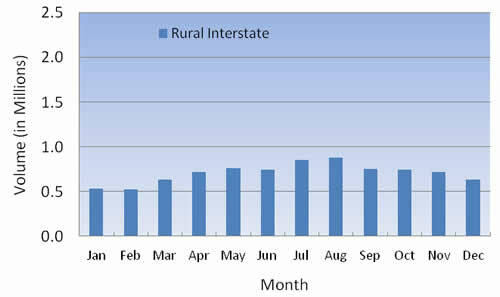 Weekend volume, while lower on the urban Interstate, is relatively higher on the rural facility, indicating recreational travel on weekends. 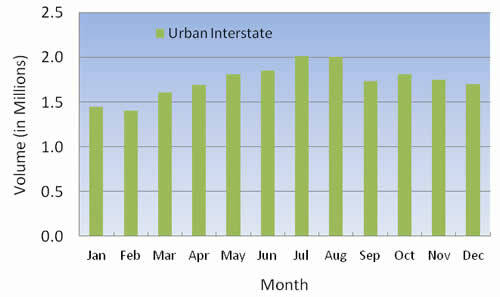 The volume of travel occurring each month is shown for selected urban and rural Interstate highways over a year, illustrating typical travel patterns. Volumes during July and August are highest, while January and February are lowest for both roads.